Last time we discovered that our faith grows when we discover the special places where we can encounter God as easily as breathing. Many Anglicans love Canterbury, others go on pilgrimage to Jerusalem and or places with a Christian history like Lindisfarne or Iona. We have our own experiences, yet they are rooted and shaped by the wider church. Now, oh weary pilgrim, our faith is given depth as we grow character through the desert. Often when we first discover Jesus Christ and the love of God for ourselves, we have a ‘honeymoon period.’ We experience the intimacy and love of the Father, the fellowship of Jesus, and the sweet wooing of the Holy Spirit. It feels like you’re in love. You ARE in love! But then later on, you may enter a period of God’s silence that appears to go on forever. It seems like a wilderness that can stretch our trust.Is it this time a punishment or a test? Is it abandonment or a preparation for something wonderful in store for us? Is it God’s judgment or His infinite kindness that helps us grow spiritually mature? Is he in fact carrying us, like the example in the famous Footprints poem? We don’t sense him but we know he is there. These times of difficulty have been compared to the ‘dark night of the soul.’ But since God has not left us, we also grow deeper in faith. During this process, we are refined of hindrances, and we gain the fragrance of Jesus by the fruit of the Spirit if we keep a good attitude and our trust in God. One of the cries of my heart as a Christian has always been the desire for spiritual maturity. When I was a young Christian, newly baptized in the Holy Spirit and so enthusiastic that I embarrassed older believers, I begged the Lord for maturity. At the time, I had experienced healing, love and empowerment, and from there, I tried to break through an unapproachable “more.” Now I know that we should always be hungry for more of God. Yet at this time, I almost felt like there was a glass ceiling over my attempts to press in for more. Eventually, my prayer was answered when I was in Northern Ireland doing prayer walks. A hostess in Belfast gave me an unexpected prophetic word. She asked me if I had been asking God to take me deeper into maturity. I answered, “yes.” She told me that it would not be easy and that it required something that I did not expect. This requirement was suffering, not as a punishment, but as the necessary instrument to bring me past the shallowness I’d been feeling even as a Christian. God’s relative silence intensified as I entered the desert of finding Him in a new way, and I began to learn identification with Christ (Phil. 3:10). I had to no longer live as if I was in control of my life, but to allow for a Christ-centred life. I was learning to know him in the fellowship of his sufferings, as well as the joy of salvation. This desert has lasted over nine years. During that time, I audited a course called “Into the Wasteland” taught by Charles Nienkirchen at Tyndale Seminary. Not only did I learn that desert experiences are common, but they are also biblical! The desert is God’s gift that demands transformation. Isn’t that what being sanctified is about? The Apostle Paul also experienced the beginning of his transformation while travelling the desert road to Damascus. His conversion was further strengthened during a three year duration in the Arabian desert (Gal. 1: 17-18). 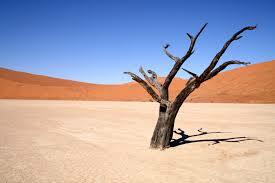 Antony of Egypt gave away all his possessions and depended on God in a fourth century desert. Many Christians desiring something more followed a similar call. Some lived in solitude or wandered the oceans as missionaries as did the Irish monks in the sixth to tenth centuries. Others were transformed during extended illnesses while waiting for a miracle. So why are we surprised when we enter our own wilderness? Perhaps, part of the reason we are surprised is due to our North American materialistic culture which sees simplicity as a weakness. Even in many churches, mountain experiences can be glorified and the grief of varied suffering is minimized. We want comfort in the midst of suffering and our one-dimensional ideas of God and all-encompassing self-experience are challenged. The desert calls us to transformation, yet we have a choice to make. We can turn to self-pity and bitterness5 during these hard times. Or, we can call out to the Lord for purification. Which would you choose? I’d far prefer the purification, and become a better Laurie-Ann. How does the desert make us more Christ-like? Charles Nienkirchen, says that the humbling effect of the desert “becomes a transforming event in one’s spiritual development only as one’s idea of God and self-image are changed. In the process, faith, hope and love are purified.” The desert can help to clear our senses of wrong illusions of who God is and who we are, although it is often a long process. Sometimes we struggle with faulty perceptions of God as a judge or angry parent. Other times we may struggle with self-condemnation and poor self-image (or vanity and pride). When these perceptions melt away, the truth can be more easily discerned. God is no longer what you thought He was, and He is now free to show you who He is! You are no longer what you thought you were, but are loved and accepted. God is allowed to be God, since you have realized that you are not God in your life. The desert may give us four gifts if we co-operate with God’s purposes: spiritual transformation, psychological change, new roles, and new futures. The first gift can include salvation and the refining that comes after it. If you’ve ever read Hannah Hurnard’s book Hinds feet in High Places, you may have identified with the character ‘Much Afraid.’ We struggle through a lot of fears, but the process of perfect love, the fear is winnowed out of us. Much Afraid was spiritually transformed by the love of the Shepherd. She turned her lessons and trials into glittering gems. This transformation is a difficult but very rewarding journey. The second gift can be the gain of a new confident humility in what Paul calls being content in all situations (Phil. 4: 11-12). This is a difficult gift to nurture, for it demands a trust in God that puts him at the centre of one’s environment. This is the desert gift that took me years to accept. He has taught me to trust Him in all circumstances, even when He seems silent and I begin to doubt my calling. It’s a lesson that I’ve learned deeper and deeper over the past fifteen years, through difficulties on mission trips, closed doors in careers, cross country moves, and living by faith. A good analogy for this is illustrated in how a poinsettia grows. Apparently these beautiful flowers require a time of darkness so they can germinate. I believe we also need this barren time for essential spiritual growth in faith, hope and love. We still experience God’s care and provision in the desert, even when He is silent; although we may not yet perceive this with the eyes of our hearts. This time can be likened to being hidden in God, like Col 3:3, where you are hidden in Christ. Yet the Apostle Paul encourages us to “keep our minds set on things above” (Col 3:2) – that perspective gives us deeper grounding. The third gift can include such identity change as experienced by Abram/Abraham and Jacob/Israel in the Old Testament, and Simon/Peter and Saul/Paul in the New Testament. To the ancients, a name change signified a complete metamorphosis in a person and their role. Abram changed from a childless man to the father of many nations (Gen. 17:5). Jacob changed from a deceiver to Israel, one who wrestles with God (Gen. 35:10). Sanguine Simon became Peter the “Rock,” one of the leaders of the early church. Law-loving Saul of Tarsus became apostle to the Gentiles and used his Roman name Paul (Acts 13:9). My own name Laurie-Ann means “Victory through Grace, Remember.” I was often bullied as a child and had to move neighbourhoods because of the harassment. When I moved, I changed my name by dropping the ‘Ann’ (which means grace). After I did this, I tried to change my identity and became a people-pleasing striver. At that time, my name became Laurie Zachar (victory, remember) Years later as a Christian, I was convicted that I never should have changed my name, and after I received some needed prayer ministry, I changed it back to Laurie-Ann. With the reminder of grace in my name, it shows me that it is His grace that is victorious, not anything that I can do on my own. After all, it is in the desert that I have learned that apart from Him, I can do nothing. (John 15:5) When I add my married name to the mix, it comes out as Victory through Grace. Remember to Persevere. Ah, the difference of perseverance in the identity change! The fourth gift concerns our calling: whether great miracles or a quiet life of faith that draws others to Jesus. It is a gift that gives us hope; we can know where we are going. It may take time to determine what we are called to specifically – I am in the process of fine-tuning this journey myself. Yet, if you have come to faith in Jesus Christ, you ARE called. We are all part of the wonderful body of Christ, and each of us has a role to play. We are vitally important to each other. Don’t expect just those in leadership to do all the ministry. We all minister to each other. Are we willing to be changed? Do we want to grow further in God? Then at some time in your journey, the desert is the place for you, as it has been for me. Don’t be afraid, it is a road that many have followed in Christ. Just remember that He will never leave you and does not forget his promises. It is in the desert that we discover just how faithful God really is! We’ll next explore how we can translate some of God’s faithfulness in our world through Christian social conscience. Perhaps part of our callings are through social justice? 1. Some of these solitary places include: the varied desert of the Sahara, the emptiness of the Arabian “Empty Quarter”, the vast arctic wilderness and the wide oceans that span our planet. 4. Elijah’s still small voice and Ezekiel’s visions filled them with the hope that God was in control. 5. Self pity is a downard spriral that Leanne Payne calls ‘descending into the hell of self.’ Another inner healing teacher of mine has called it PLOMS disease, or Poor Little Old Me Syndrome. This effectively stops all growth and is like quicksand that pulls us down.